This property owner in Weybridge recently had a new fridge delivered by a well-known electrical retailer that has an unusual policy of not protecting its customers’ floors when installing heavy appliances. 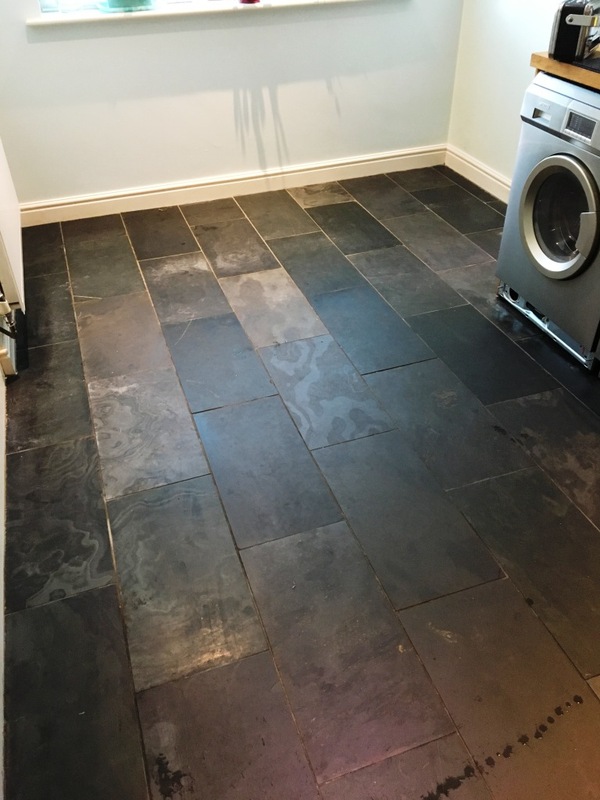 Predictably, the lack of care and consideration resulted in multiple unsightly scratches being left on the fantastic Slate tiled floor, mostly notably in front of the dishwasher, which was also newly installed. Understandably, the property owner was not best pleased. He was keen to have the situation remedied as soon as possible. 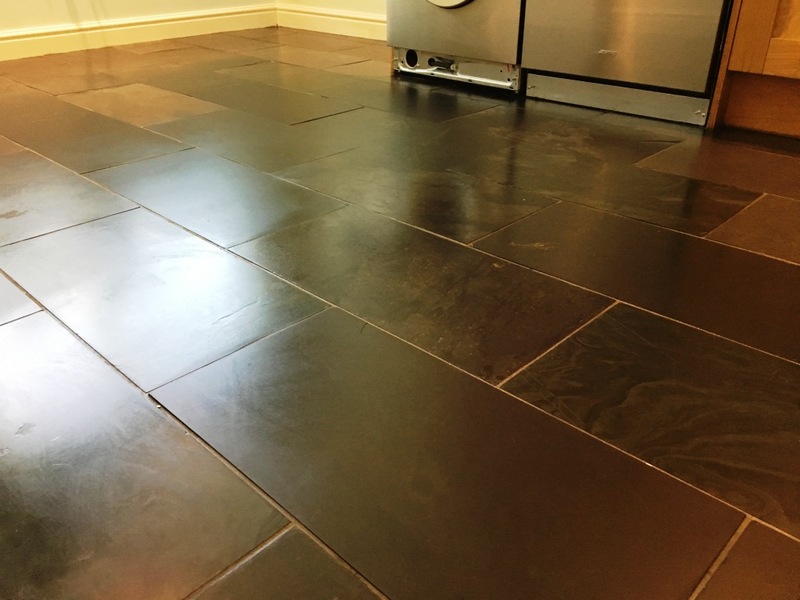 At Tile Doctor, we not only provide tile cleaning services but we also have the experience and equipment to hand all sorts of related issues including the restoration of scratched tiles. Happy to help. I travelled over to Weybridge to address the problem. The surface of the stone was damaged and the only way to repair it without the repair standing out was to strip and polish the whole floor. I therefore began the restoration by stripping the whole floor of its old sealer. The customer had marked all the deep scratches he wanted to have removed with sticky notes. I explained to him that burnishing, a type of polishing carried out using diamond encrusted handheld blocks in combination with a little water, would be perfect for this job. The process of burnishing essentially grinds away the damaged layer and then re-polishes the stone, the process would remove the scratches and rebuild the shine. It involves the application of different grades of pads from coarse to extra fine and a little water to lubricate the process followed by a rinse with more water in-between each pad to remove the slurry generated by the process. After burnishing the floor is left polished but damp, however to save time I able to speed dry the whole floor using a powerful industrial air mover. Once the floor was dry the final task was to re-seal the tiles. I did this using a couple of coats of Tile Doctor Colour Grow, a colour intensifying, impregnating sealer which soaks into the pores of the stone protecting it from within against ingrained dirt and stains for many years to come.